Join our 3 hour SUP course and learn the techniques! Stand- Up- Paddling or SUP as it is popularly called, is a new global sport with Hawaiian heritage. This ancient form of surfing can be traced back to the early days of Polynesia, and today there are many variations of the sport. It is in fact one of the world’s fastest growing sports. Worldwide, particularly women have embraced the sport and it is also both fun, challenging and can be physically demanding, depending on how one chooses to use the sport. As exercise, recreation or surf. In waves it requires balance, but on flat water everybody can participate, even though you can still be challenged on the balance sheet. 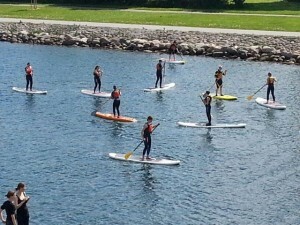 SUP is a good exercise for the whole body, especially the upper body is activated, and provides a good core workout.This introductory course provides a good experience and an overview of what SUP is, and works on basic paddling techniques, styles, balance and rescue exercises. 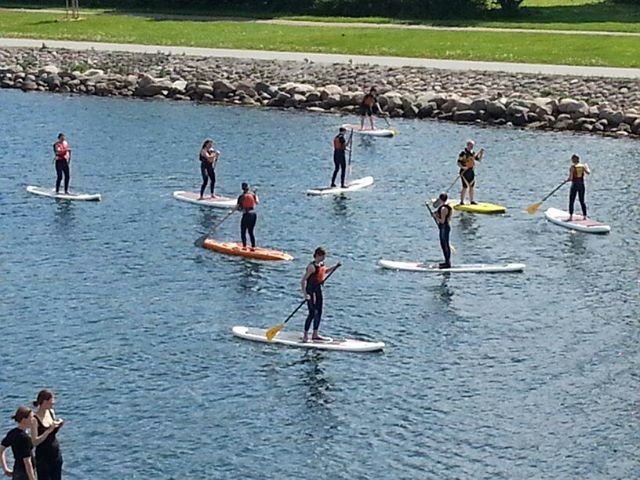 We always warm up and stretch out on our SUP courses. Equipment: We provide all the equipment. Bring your own swimsuit, towel, ect. The course is every Sunday from 13-16 from May – September. Sign up via Kajakhotellets website, via this link. We look forward seeing you on the water!